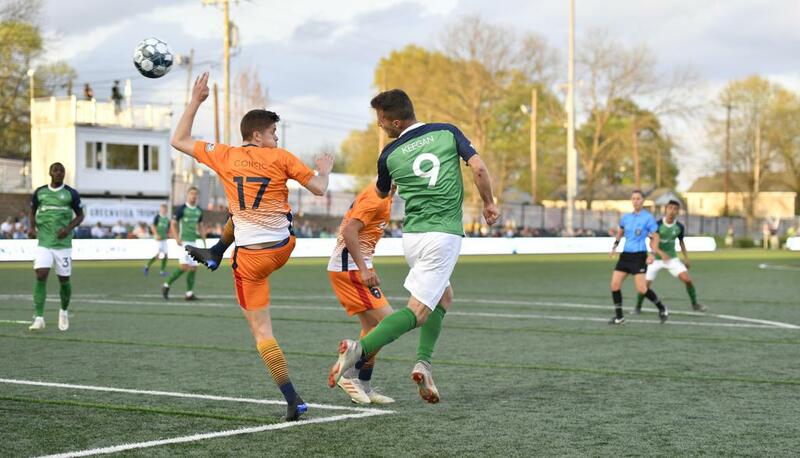 Greenville, S.C. – The Triumph netted the first win in club history with a 2-1 victory over the Lansing Ignite in the team’s inaugural home match at Legacy Early College Field in West Greenville. A raucous sellout crowd of 4,014 fans filled the stadium for the first time and were treated to an eventful match that saw the home side secure their first 3 points with a late own goal on Lansing. Lansing drew first blood, scoring in the 27th minute on ball that just missed the fingertips of Triumph keeper Dallas Jaye. After an improbable string of narrow misses by the Triumph, the club broke finally through in the 54th minute with their first-ever goal off the foot of Jake Keegan just inside the 6’ following an advantage and assist from Carlos Gomez. Level at 1-1, the match saw then two red cards handed out to Lansing players in a 5-minute stretch. Though the Triumph also went down a man with Cole Seiler being sent off in the 78th minute, the club took advantage of 10-on-9 and scored their second goal on an own goal by Lansing’s Grant Stoneman. The Triumph will look to build on their win as they return to Legacy Early College Field on April 13th against the Chattanooga Red Wolves. Tickets can be purchased by visiting greenvilletriumph.com/tickets.